When you hear the words cereal grains, you might think of Rice Krispies, Corn Flakes, Wheat Chex, or Quaker Oatmeal. But you may be surprised to know that cereal grains (not the flakes — the grains) and many other grains can be used to make different kinds of beer. 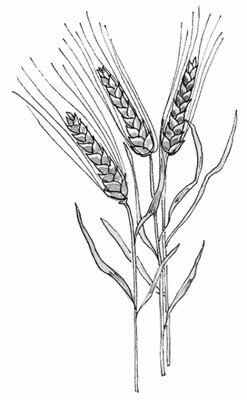 But the cereal grain that lends itself best to beer making is barley. Before barley grain can be used to make beer, it must undergo a process known as malting, in which moisture stimulates the natural germination process inside the grain. Malted barley gives beer its color, malty sweet flavor, dextrins to give the beer body, protein to form a good head, and perhaps most important, the natural sugars needed for fermentation. Barley’s role in beer making is equivalent to grapes’ role in winemaking: fundamental. Malted barley comes in a variety of colors, flavors, and degrees of roastiness that profoundly affect the color and taste of the beer. Although barley is the most commonly used grain in beer making, many brewers use additional grains, such as wheat, oats, or rye, to imbue their beer with different flavors. These specialty grains all serve the purpose of creating different flavors and levels of complexity in the beer (and perplexity in the beer critic). The principal difference between these grains and cheaper, adjunct grains, like rice or corn, is that specialty grains are used to enhance the barley, not replace it.